Please join us at the studio for a fun filled Holiday Craft Fair on Sunday December 10th from 11-5pm. TEN+ local artists will be selling their special goods // Josah Perley of @tacoschanti will be selling her yummy tacos + salsas // Jamie Lau of @jamielaudesigns will be selling her beautiful clothing + other sewn accessories // Jenifer Lake @jenifer_lake will be selling her special ceramic wallhangings, necklaces + incense holders // Jessica Hannah of @jhannahco will be selling her lovely perfumes + bath salts + balms // Jen Hewett @jenhewett will be selling her unique printed textiles + paper goods // Jenice Anderson of @canativejewelry will be selling her handmade jewelry // Tania Skevos @taniaskevos will be selling her colorful beaded jewelry + knit hats // Diva Pyari of @lineacarta will be selling her printed linens + stationary ephemera + calligraphy supplies // Lisa Fontaine of @hyggedesign.xyz + @morningtide.shop will be selling her awesome clothing line + homewares + curated gift boxes // Rachel Stevenson of @marigoldpots will be selling her fun ceramic pots // Sam E of @shopsame will be selling her leather patchwork pieces // Veronica Llave @llaveronica will be selling her one of a kind festive wreaths // Sarah Pedlow of @threadwritten will be offering relaxing chair massage in the back room // See you on the 10th! 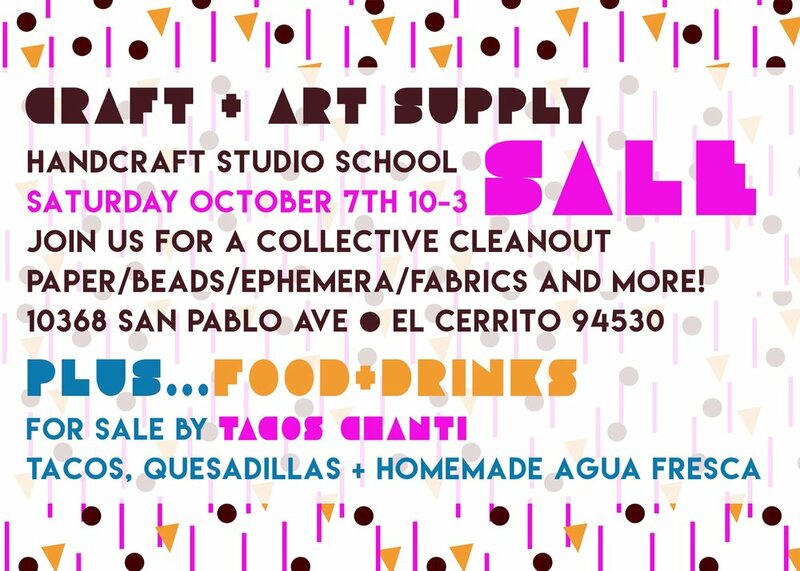 Stop by the studio to pickup a few treasures at our Craft & Art Supply Garage Sale on Saturday October 7th. Local artists and collectors will be selling their extra supplies to the studio community from 10-3. Vanessa Silberman’s music & live show has been compared to a Female Nirvana that's slightly punk & energetic at times similar to The Ramones but then expands & ranges to the likes of Chrissie Hynde meets Patti Smith & Neil Young. Recently wrapped up a West Coast tour featuring Reed Mullin of Corrosion of Conformity and producer/musician Mikel Ross. In the last 22 months Vanessa has played over 300 shows in support of different singles & self-titled VANESSA SILBERMAN EP. Read more about Vanessa HERE. Carissa Johnson is addicted to playing rock and roll. The kind of sweaty, turbulent, in-your-face, post punk rock that makes uptight people squeamish and uncomfortable. Hailing from Boston MA, rock artist Carissa Johnson has proven to leave her mark and she is just getting started. With a debut full-length album winning “Album of the Year” by the Limelight Music. Find out more about Carissa HERE. Please join us for our Third Annual Holiday Market featuring local artists. Our last Holiday Market was such a successful and fun event, we are really excited to continue the tradition. Vendors participating in the market include: Tania Skevos // Diva Pyari // Danielle Andress // Jenny Fong // Jen Hewett // Jessica Hannah // Alyson Vitt // Kelli Ronci // Caroline Matthes // Jenifer Lake // Cassie Brown // Theresa Weller // and more. Stop by the studio to pickup a few treasures at our Craft & Art Supply Garage Sale on Sunday November 29th. Local artists and collectors will be selling their extra supplies to the studio community from 11-3. Join us at the studio for our first Craft & Art Supply Garage Sale where artists and collectors sell their extra supplies. Food and drinks will also be for sale. Handcraft Studio School will have a booth at Urban Air Market in Dogpatch on Sunday August 17th from 11-6pm. See you there. On Saturday June 21st from 2-5, the studio will transform into a Jewelry Box Pop Up Sale to benefit a local woman and her family as she battles brain cancer. Please come support this cause! Together with Traveling Miles Studio, Handcraft Studio School is hosting a Makers Market on Friday June 6th & Saturday June 7th from 12-5 daily. Join us at the studio the second Wednesday (EXCEPT June 11th) of each month from 6-9 pm for an open craft night. Bring your lasted project to work on, grab a drink and snack, and enjoy the company of other creative people while working with your hands. $10 donation suggested. Join us the second Wednesday of each month for our open craft night. Bring whatever project you are working on and enjoy the company of other creative people. Refreshments and snacks provided.